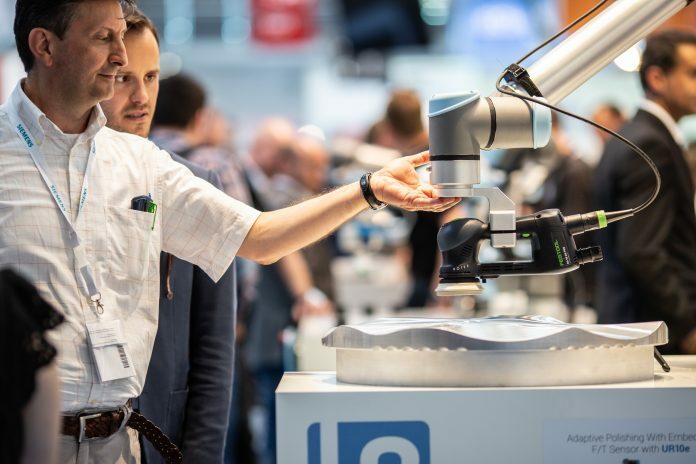 Universal Robots, the market leader of collaborative robots, is ready to launch unique new offerings for metal fabricators including plug and play integration with Dynabrade orbital sanders, ARC Specialties’ SnapCut, and new 7th axis capabilities from Vention. 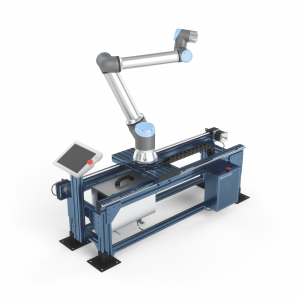 The new offerings are all integrated with e-Series, Universal Robots’ new flagship line. A traffic stopper at last year’s FABTECH was SnapWeld, the first integrated MIG welding system for collaborative robots. SnapWeld was developed by Universal Robot UR+ partner and Certified Systems Integrator ARC Specialties in Houston, TX, and will be showcased this year in a live demo at Universal Robots’ FABTECH booth C-12116 in an upgraded version compatible with UR’s just-launched e-Series line of cobots. A new offering this year from ARC Specialties is SnapCut exhibited at FABTECH in a pilot version coming soon to UR+, the platform for plug and play products certified for UR cobots. SnapCut allows traditional metal fabricators to easily cut shapes in 3 dimensional steel components with no prior robotic or computer programming knowledge. SnapCut utilizes the UR10e collaborative robot from Universal Robots to manipulate a Hypertherm cutting torch to desired positions around the cutting path. Included in the SnapCut software integrated directly on the UR robots’ teach pendant, are standard shapes like squares, rectangles, circles, or C-channels that can be selected for parametric programming. The operator will simply move the cutting torch to a few locations on the cutting surface, hit run and watch the sparks fly. For new deburring capabilities with cobots, manufacturers can now turn to ATI Industrial Automation’s new Compliant Deburring Blade (CDB) one of the most versatile tools for material removal. Intended to replace traditional hand deburring tools, the CDB excels in light and medium deburring, chamfering, and scraping operations on materials such as plastic, aluminum, steel, and brass. Axial and radial compliance reduce robotic programming time by maintaining constant force where surface irregularities are present. CDB will be showcased in UR’s FABTECH booth and is in the UR+ pipeline. UR10e with American Weldquip’s ArcSafe robotic welding torch system collaborative robot featuring the Robo-Quip robotic nozzle cleaning station. 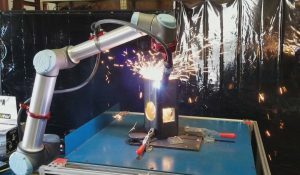 American Weldquip chose Universal Robots UR10e because it is only one of the few collaborative robot systems that can be used in welding applications, allowing operators to work alongside the cobots without the need for the usual safety guarding. UR10e integrated with SnapCut end-effector for plasma cutting applications. (See above). UR 5 showcased with ATI’s UR+ enabled MC-10 tool changer and Axia80 f/t sensor. Unlike load cells, which only operate on a single axis and measure only push, the Axia80 senses torque and side loads along all six axes. Crum Manufacturing will exhibit a UR3 with a Gocator 2330 from LMI Technologies demonstrating the ability to line track, profile scan and measure parts. The use of a laser profile scanner allows the robot to easily determine pick locations on randomized part positions. This also allows for easier part quality control, as the Gocator is able to measure the parts that the robot will be picking. COB Industries will display a UR3 in Huntingdon Fusion Techniques’ inert welding environment, that have grown very popular with the additive manufacturing industry who utilize the HFT inert environments in conjunction with robots to apply 3D printing techniques with specialty materials such as titanium and tantalum. UR3 integrated with TG-IL, Innerspec’s latest generation of EMAT thickness measurement. The UR3 scans a non-contact EMAT UT transducer along the length of an aluminum tube, measuring wall thickness variations to +/-0.0001”. TG-IL is housed in an IP54 industrial enclosure and is ready to be integrated into any industrial environment where automated thickness measurement is required. UR10e mounted on Vention’s fully customizable 7th axis range extender (See above).